This recipe for homemade tomato salsa is one that is especially good to make in the summer when the tomatoes are ripe, plentiful and sweet. Combine all the ingredients in a large pot and bring to a boil over medium-high heat. Reduce the heat to medium once it comes to a boil. Simmer, stirring often, for 10 minutes. Remove from heat and ladle into hot, sterilized jars. Seal and process in a boiling water bath for 10 minutes if the salsa is to be stored for a while. If you do not process the salsa in the boiling water bath it must be eaten within a few days. This tomato salsa recipe makes 6 - 2 cup jars. 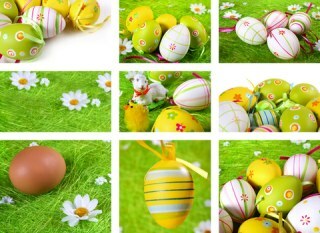 Enjoy all year round. This recipe also makes a great "from the kitchen" gift. Add chopped hot peppers or hot sauce to your taste to up the heat content. 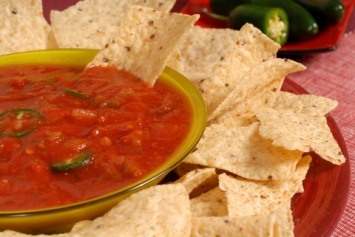 Add 1 cup of sour cream to 1 cup of salsa for a delicious creamy dip. This recipe is gluten free, fairly low carb and a great diabetes recipe. It actually suits most diets and eating requirements quite well. This salsa recipe calls for processing for long term storage. It is a great recipe to make up if you want to have access to your homemade tomato salsa any time of year. It stores for a long time when canned and can be enjoyed all year long. However, if you intend to eat it within a few days, there is no need to process it in the boiling water bath. If this recipe for homemade tomato salsa leaves your mouth watering for more sweet tomatoes, you’ll find tomato recipes here. I have just made 3 batches of this. I didn’t have coriander leaves so I used ground coriander seeds, it tasted good as I realize leaves and seeds are very different. I used about 3 tbsp ground coriander per batch. I also added garden salsa peppers which are normally hot but it was still mild. Too make it thicker I think next time I will drain tomatoes before adding the other ingredients. I just made 2 batches of this Salsa, with fresh tomatoes from my garden, it is delicious.. and by far the easiest Salsa recipe that I have found…I also added some Jalepenos…I am about to pass it along to my sister…. Fry chicken breast in non stick pan until no longer pink. Pour salsa over chicken breast and heat up. Add cheese on top, then cook until cheese is melted. Thanks Sharon! I stumbled on this myself just a week or so ago. Chicken cooked in salsa is great! Hi – I made this salsa this afternoon because I had a bunch of roma tomatoes. I didn’t have enough to make the whole recipe so I only made half of it and added one small jalapeno pepper (seeds included) and it is fairly mild. I just served this with corn chips as a snack to two Chinese friends who are new to Canada and miss Chinese food; they loved it! Next time I make this, I’ll be sure to make the whole recipe if not double it. I’ll also add a jalapeño pepper to the recipe. I think I’m going to go out and look for more roma tomatoes tomorrow! It tastes fresh and bright 🙂 and I’ll be proud to serve this any time. How long do have to wait to eat some ? From Karen: You don’t have to wait at all Tina. You can eat it immediately, even before it is processed in the jars. Just make sure it is eaten within about 4 days to maintain freshness if you don’t process it. Wellllll…. I gotta say this wouldn’t really pass for “salsa” around these parts – the Southwest – specifically, Phoenix, AZ. Sounds “ok”, but… no chile peppers?!? At ALL?? Not even mild green chiles? Also, you are cooking all of the sauce, not leaving some of the veg’s raw or barely cooked as salsa is made around here. Also, you are adding vinegar to it; salsas shouldn’t have vinegar so really you are making more of a “hot sauce” … um, that isn’t hot… I make salsa a lot and friends and family all tell me it’s as good as what you get at a good restaurant. Oh, and one more thing… it HAS to have fresh chopped cilantro to get that real authentic taste. Start heating the water and tomato juice at medium heat and start chopping veggies! Add about half of each veg as soon as you chop it; reserve the rest to be tossed in later. (chiles should be seeded and stripped of the white pulp unless you want it really hot). Add spices/seasonings. Turn down to low and let simmer about an hour, until veggies are all cooked down and soft. Add remaining chiles and cook just until soft – about 10 minutes. Add the rest of all the veggies and cilantro and remove from heat to cool. I have never tried to make salsa, but I followed the directions only I added a can of jalopenos. It tastes just like the salsa i used to get when I went to resteraunts in Texas. It is wonderful.